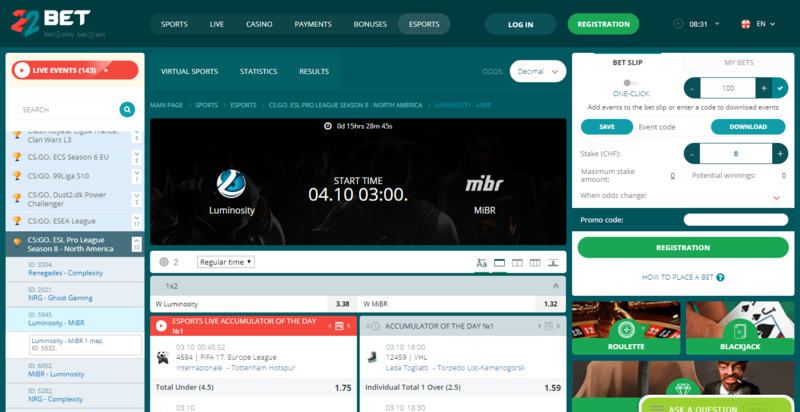 CSGOBET.CLICK - All the best Esports betting sites, in one place. This is a list of all the best eSports betting websites. Browse among different types of betting sites and find one of your liking. If you are a website owner, please fill out a contact form and the list will be updated accordingly. 100% Bonus for up to $50 ! The term “eSport” refers to any “electronic sport”. Many popular games have “eSports Leagues”, similar to real sport leagues like FIFA or the NFL, where players compete as professionals against each other. Outcome betting is a simple gamble, who will win a given match? Team/Player A or Team/Player B? This is the type of betting that is more beginner-friendly, as it requires only enough knowledge to know who should win on average. Proposition betting, also known as prop/parlay betting, requires significantly more understanding of a given match. To bet on propositions with some success you need to know both Team A and Team B thoroughly and be able to estimate result in detail. The idea behind a prop bet is that it will give odds for specific results. For example, a match is a best-of-five games to decide the winner. A proposition bet on this might be ¨Team B wins 3-0 games played¨, possibly shown as “Team B wins, handicap -2 games” or “Team A loses, handicap +2 games”. It can be phrased any way, just understand the final result that the proposition bet actually wants when making a bet. Proposition betting should be approached the same as normal betting completely and sometimes can be even more profitable if you really can understand the given teams of a match. Now, it’s not as simple as “double your money if you’re right”. Esports bookkeepers calculate something known as Odds. Odds are the mathematical calculations of what a bettor gets when he/she wins a bet. Most sites display odds as >1.00, this is because the odds are a multiplier towards the amount you bet and you are guaranteed back your amount bet. So, a 1.25 odds with a $100 bet will yield $125 total, a $25 profit. 2.00 odds on a $100 bet will yield $200, a 100$ profit, and so on. Odds determine whether or not betting on a match is really worth it. The idea behind this is that, based upon what research is done on both teams, you make your own set of odds. This set of odds you make is your own “real odds”, while the odds on a given site is the profit margin. For example, Team A vs Team B and the returns on the site odds are, assuming no house cut, 1.50 to 3.00, Team A will win 66% of the time basically. However, you determine the real odds, after researching or based on prior knowledge, to be 2.00 to 2.00, as in each team will win 50% of the time. Theoretically, betting Team B would be profitable in this case. Over 100 games, based on the “real odds” and 100 $1 bets, Team B will win 50 games, +$100, and lose 50 games, -$50. While betting on Team A will result in +$25 from 50 wins and -$50 from 50 losses. On average, Team B will result in +$50 and Team A would be unprofitable at -$25, under the assumption your “real odds” are accurate. Betting on average profit and margins between house odds and “real odds” is the general idea to profitable betting. However, this does not tell you how much you should actually bet on a match as a single instances is not the same as an averaged 100 matches, one match can have many more unpredicted circumstances and so it is important to limit risk. Now, a single match having nearly 68% of your bankroll on it is very risky, as mathematical calculations by an individual can never be fully correct and there is still a 1 in 3 chance that a single instance will result in a loss even if it is fully accurate. Since this is generally the case with Kelly results, it is important to determine how much of the Kelly Bet Size you think is appropriate to eliminate unnecessary risk based on bankroll and objective thinking. Consider factors like how far off your “real odds” are compared to the house’s odds when making bet sizing. Many veterans use the Kelly Criterion + a constant to limit risk. For example, they would take ⅓ or ¼ of the Kelly Criterion suggested bet size. The idea of risk that is being generated is due to the nature of an individual having a finite bankroll, going bust is always a strong possibility and it is only exasperated by Kelly’s large percentage suggestions. Sidenote: Kelly can also be used for specific proposition bets, just substitute in the proper information. As discussed in a previous section, there is generally a difference between the house’s odds and the “real odds”. To create your own real odds, you must have a grasp of certain concepts. Simplify variables that will affect the odds. This is an important skill, as most games have a large number of undetermined variables, each weighing on the odds differently. For example, CSGO has a “map pool” as in, there are 7 unique maps that heavily affect the abilities of every team. Some teams may be amazing at one map while others do not even know how to play it. For a Best-of-3 match between Team A and Team B, the 3 maps selected to play will have a heavy impact in who will win. So, predicting maps played would be a significant variable. However, something like an Offline event (LAN) vs Online event, may affect only a few teams and slightly at that. Thus, it’s a non-issue and not considered in creating odds for most matches. Being able to create simplified lists of variables can help you gauge your “real odds” more efficiently. Research. It has been briefly mentioned several times, but knowledge is possibly the most important item. Research heavily factors into the variables at play as well as the overall odds. Sometimes breaking news like an injury on a team’s player or last-minute stand-in for a player is announced, that’s considered research and greatly changes the effectiveness of a team. It’s also important to note for researching to have an understanding of both immediate and historical results. Historically, a team might be very good, but recently have suffered internal issues, injuries, etc. and have looked lackluster. Such an observation is important in creating odds. All teams are gauged relatively to each other. Thus, it’s important to create your own understanding of these teams and how they relate, finding resources like tournament placements, past results, or Video-On-Demands (VODs)/watching teams live will give you a rough idea of their ability to play compared to their opponent, and so the more teams you are aware of the more you can compare them all relatively to each other to create at least a basic grasp of who would win purely on skill or ability. Being able to make accurate statements based on research is crucial and will generally allow you to make somewhat accurate odds, especially those for proposition bets of a certain result. More accurate than otherwise at least, and it will result in greater chance of success for betting. Thus, by these two major concepts, you can make your own odds. The judgement is entirely an individual’s to make and their success is based upon these fundamentals for making accurate assumptions of the odds. Whether someone is aware or not, these concepts are always at play and being able to develop a sense of average wins in 100 matches or the strength of Team X’s individual players or any other factor can make and break you.